Vaccination and the Republican presidential debate: where did THAT come from? California governor Jerry Brown recently signed into law a bill that eliminates religious or philosophical exemptions for childhood vaccines. Under the new law, parents may only opt out of vaccinating their child if a doctor signs off on a medical exemption. And apparently a string of tweets in more or less the same vein. “They say mercury in fish is dangerous, but forcing our children to be injected with mercury in thimerosal is no risk. Make sense?” etc. Just to clarify, he added that he is not anti-vaccine but “anti-toxin” apparently..
It’s the same old tired nonsense anti-vaccine groups have been spreading for years. Never mind that none of the vaccines administered to children (with the exception of some flu vaccines) contain thimerosal, and that the dose of thimerosal in a vaccine was tiny to begin with. Never mind that all the plant food you eat contains some aluminum, because aluminum is one of the most common elements in the Earth’s crust, you find it in many soils in the form of aluminosilicate minerals, and various plants take up small amounts, so your diet regularly exposes you to significantly more aluminum than you get from a vaccine. The average human naturally contains somewhere between 30-50 mg of aluminum at any given time, mostly in your bones although blood typically contains 1-3 parts per billion of aluminum — and all of that is again completely normal; it’s a result of dietary exposure. And never mind that a baby’s blood naturally at any given time contains over ten times more formaldehyde than any shot. 3) what kind of dose is required to reach a dangerous concentration (given the rate at which the chemical is metabolized/excreted). Or you could just ask “what is a dangerous dose”? Which is kind of the three questions above just rolled into one. Anyhow. But let’s leave aside specific ingredients here for a minute and ask what’s the evidence on safety for vaccines as a whole. There have been numerous large studies looking for statistical correlations between vaccines and autism and a variety of other disorders. No evidence of any connection was ever found. This 2009 paper summarizes some of the data available in 2009; there is even more data available now and the conclusion has not changed. It is possible to have an allergic reaction to a specific component of a vaccine, in the same way that some people are allergic to bee stings or to peanuts. But these kinds of allergic reactions for vaccines are extremely rare and typically start within a few minutes of receiving the vaccine. They exhibit the same kinds of symptoms as an allergic reaction to a bee sting (hives, swelling, shortness of breath, low blood pressure etc.) and pose the same kind of threat. And they can be treated in much the same way as an allergic reaction to a bee sting; in fact, as long as an allergic reaction of this kind is treated ASAP, it’s completely reversible, just like an allergic reaction to (again) a bee sting (did I say that already?) If someone has shown an allergic reaction to a specific vaccine in the past, then obviously they should not receive that same vaccine again in the future; and under CA’s new law they would have a medical exemption. There are also a variety of mild possible side effects like injection site swelling or low fever that are not dangerous or life-threatening. Part of it is that we humans are so good at spotting patterns and correlations we find them even where they don’t actually exist; where they’re just a narrative our minds have imposed onto real events. As Paul Offit pointed out, roughly 50,000 British children received the MMR vaccine every year in the late 90s; usually they were between ages 1 and 2, an age at which autism is often diagnosed. Given the number of children immunized and the number of children diagnosed with autism each year, statistically the odds are that in any given year 25 children will be diagnosed with autism shortly after they are vaccinated simply through sheer chance. Even though there is no link, the parents will assume there is a link because the one happened shortly before the other. It’s a little like if you got a call on your cell from an area code you didn’t recognize, say 303, and got in a car wreck three minutes later. Even the most level-headed of us might wonder for a moment whether there was some connection, even though there is obviously no connection between the call and the crash. But the human brain always tries to find connections, and when one event precedes another we tend to wonder if they might be linked (even if they aren’t). 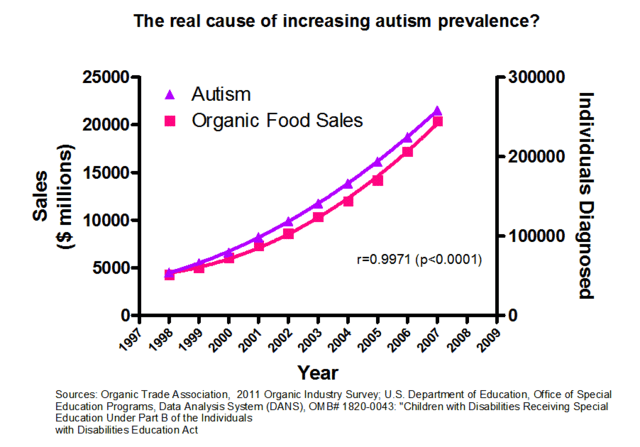 Do you really think organic food is actually the cause of autism? This sounds silly, but keep in mind that some anti-vaccine folks have made exactly the same argument vis-a-vis the MMR vaccine and autism. Another part of it of course is that once you start a controversy it’s very difficult to end it. There are always a handful of conspiracy theorists and other tinfoil-hat types out there who will keep pretty much any controversy going for years or even decades after it should have ended. Even leaving the wingnuts aside, however, I think controversies of this kind tend to take on a life of their own because it’s much easier to scare people than to reassure them. And that’s where I fault the people who originally started this controversy; British doctor Andrew Wakefield and the journalists who briefly made him a household name. Or take diphtheria. According to the CDC, the fatality rate for diphtheria is 5-10%, and in kids under five it’s more like 20%. (Back before modern medical care it was 50%). That means even with appropriate medical treatment as many as 1 in 5 small children infected with diphtheria will possibly die. And OK, sure, rubella is significantly more mild; the fatality rate for this disease is low. Only problem is, ~90% of pregnant women who get rubella will pass it to their fetus, which can cause either birth defects or miscarriage. That’s kind of a problem. Before the vaccine, an estimated 4 out of every 1000 babies was affected with birth defects or problems caused by a rubella infection. So what I’m trying to say is…this is not your common cold. These are nasty diseases. These are not diseases you want spreading around. And to Jim Carrey and those of like mind. If you are still worried about the safety of vaccines, please, read up on it (and I don’t mean trawling Google for random crank websites — you’re in real trouble if you believe everything you read on the Internet). Try that 2009 paper I linked to for example; or try this list of studies on vaccine safety. Please read up on this before you keep making the same tired nonsense arguments about it. Because this is getting kind of old already. Nearly everyone likes fireworks, with the exception of cats. (Cats hate them with a fiery passion like the cuddly little haters they are.) Something about the bright colors against a black sky appeals to our imagination. For me as a chemistry-type person, I love fireworks shows for an additional reason — because fireworks are a beautiful display of some simple yet violent chemistry in action. As a general rule, selfish people don’t get along well with other selfish people, and the same is true of elements. As you go towards the upper right-hand corner of the periodic table, elements get more selfish about how they share electrons, as you can see in the chart below. The higher the number, the more selfish the element. Fluorine is the undisputed king. This is by no means the only trend that determines how elements behave; other things like size and available orbitals are very important. But it’s a good general rule that if you see oxygens, chlorines and/or fluorines bonded to each other, the resulting molecule is probably not very happy. It may blow up at room temperature or it may need you to give it a push in the form of heat and a spark, but make no mistake, it wants to react with a molecule made mostly of less selfish elements (aka a fuel). is a hideously unhappy molecule, and you don’t need to make it to know that. It’s dying to react with somebody, anybody, really. From what I’ve heard (most chemists have never worked with this stuff) chlorine trifluoride reacts explosively and violently with water, brick, concrete, asbestos, wood, sand and safety gloves. Basically anything and everything, in other words. Some Nazi scientists made some of this because they were looking for new ways to blow things up and even they decided it was too nasty to play with. OK, so that’s kind of an extreme example. How about this one? Oxygen gas. We don’t think of this as very dangerous, because it’s in the air we breathe, but watch what it does when you give it a spark and some fuel. Those two oxygen atoms aren’t very happy about being stuck together, and they’d really like to react with some carbon-containing compound to make water and carbon dioxide, both of which are much more stable. The two oxygens are joined by a double bond, however, and breaking that double bond takes a reasonable amount of energy, which is why these reactions are very slow at room temperature. Increasing temperature speeds up most reactions exponentially; this one is no exception. You also know peroxides from the hair salon, where chemicals that contain a peroxide group react with the molecules that give your hair its color and thereby bleach it, although they probably damage your hair a little and make it more brittle in the process (more split ends). Or my favorite peroxide: benzoyl peroxide! At high concentration it’s an explosive; at the low concentration in your spot cream, by contrast, you’re reasonably ok (although it will bleach your pillowcase pretty effectively). The hypochlorous acid is an even more brutally effective bacteria-killer than the hypochlorite ion. Or how about this critter, the nitrate ion? Nitrate is actually way less reactive than any of these other critters we’ve met so far; nitrogen is a much smaller atom than chlorine, and the bonds that connect it to the oxygen atoms are short and reasonably strong. At room temperature, it doesn’t do much of anything. Many organisms can use it as a source of nitrogen for making amino acids, which is why you find nitrate salts in many of the plants and vegetables you eat. But if you take a concentrated nitrate salt, give it some fuel to react with and a nice push in the form of a spark, it too will blow up. Part of the incentive here is that this reaction will form nitrogen gas, which is extremely stable, and water and carbon dioxide, which are very stable as well. (Nature always wants to go from less stable to more stable in chemical reactions.) Hence gunpowder. Gunpowder is a mixture of potassium nitrate (what used to be called potash), sulfur and charcoal. What if — instead of nitrogen in the center of that molecule — you had a chlorine atom? Now you’re talking hideously unstable and violently explosive — and that brings us back to fireworks. On the left is the chlorate ion; on the right is perchlorate. At first glance perchlorate looks like it should be the more violent of the two, but in fact chlorate is much more dangerous because it takes a lot less effort to get chlorate to lose its cool, and in fact some chlorate-fuel mixtures have been known to detonate rather unpredictably — not a quality you want in a firework (or anything else for that matter). So perchlorate salts are more common in fireworks, although nitrates are used too. The firework is a mixture of the oxidizer (perchlorate, nitrate etc.) with a fuel, a carbon-based compound or less-selfish element that the oxygen from the oxidizing agent can partner with; say aluminum or a magnesium-aluminum alloy for example. The reaction between fuel and oxidizer gives you heat, gas and explosion. A binder like dextrin (starch) holds the fuel and oxidizer together in chunks called stars that scatter from the firework shell casing as it bursts. And the binder also serves as additional fuel. But what about the colors? That’s the cool part. The colors come from metals, mostly metals in the first two columns of the periodic table like sodium or strontium or barium. All of these metals have either 1 (in the first column) or 2 (in the second column) electrons in their outermost shell, and they badly want to give those outer electrons away; so they’re never found in Nature as the pure metal. Instead they’re found as salts, compounds where the metal has a +1 charge (1st column) or +2 charge (second column) and is paired up with negatively charged ions like chloride to balance the charge out. Most of these salts are considerably more stable and nonreactive; the folks who wanted to give electrons away gave them away, the folks who wanted the electrons got them; everybody’s happy. That’s why the color doesn’t come from a chemical reaction, because the metal ion doesn’t do any reacting; it comes from radiation emitted by the metal ion itself. As the star explodes it releases a ton of energy as heat. Colliding molecules heat up the metal salt, causing electrons in the metal ions to jump to higher energy levels. The metal ion is now in an “excited state”; it wants to get back to the stable state it was in before. So the electron bounces back down to the lower energy level, releasing that excess energy in the form of radiation. The difference in energy between the higher energy level the electron was at and the energy level it went back to determines the wavelength of the light that’s emitted, and that’s why each element has its own characteristic “emission spectra”, wavelengths of light it emits when heated. 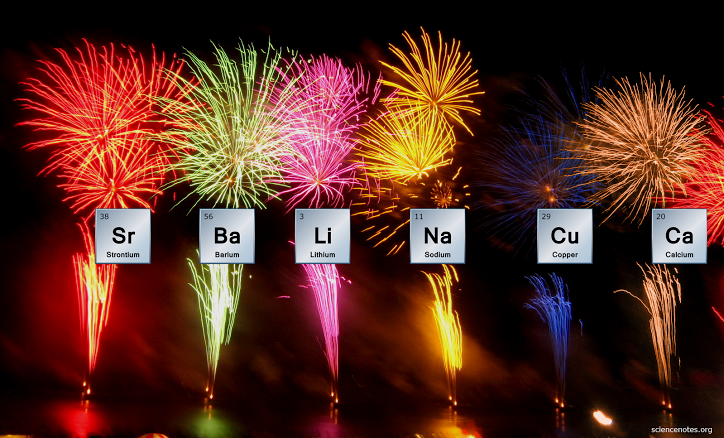 Here are sodium, hydrogen and neon gas, for example: Each metal has its own emission spectra, so each metal salt gives a firework a distinctive color; like this: The colors you see in the firework are a lovely illustration of quantum chemistry in action. Much as we all love fireworks, I have to admit they may not be completely innocuous. For example, there have been some reports that fireworks displays deposit a little leftover perchlorate in the water beneath them, which is interesting because perchlorate is a dangerous carcinogen. Whether this is worthy of concern I don’t know. The paper I cited, for example, looked at perchlorate concentrations in a lake after fireworks displays and found that although concentrations jumped right after the display, they dwindled quickly after that as microorganisms converted the perchlorate to harmless chloride ions and oxygen. (Bacteria that break down perchlorate? Yep, believe it or not. I swear…sometimes it seems like there are bacteria that can break down pretty much anything.) So it’s possible that whether or not this is a problem depends partly on the nature of the local microbial ecosystem, IDK. Either way…the fireworks this year are gonna be awesome. Get out there and let’s go enjoy watching some noisy, brightly-colored chemistry. Who’s afraid of bisphenol A? For years now, many environmentalists and consumer advocates have called on the government to ban a chemical called bisphenol A or BPA. It’s found in various plastics like polycarbonate and the epoxy resins that line the inside of tin cans, and so it leaches into various foods (especially canned foods) at low concentrations. The FDA and the EU have concluded several times it was safe at the levels present in food. In response, some folks accused FDA of surrendering to industry pressure. New York Times columnist Nicholas Kristof claimed that “Big Chem” was blocking action by FDA and deliberately exposing Americans to dangerous chemicals. “In my reporting around the world,” Kristof wrote, “I’ve come to terms with threats from warlords, bandits and tarantulas.” But chemicals like BPA scared him much more than any of those. I imagine it was hard for many like Kristof to understand what FDA was thinking. Here was a chemical that could mimic the effects of estrogen. Various studies had found BPA at high concentrations in blood and urine samples from people in the general population. Why wasn’t it banned already? Clearly industry pressure on FDA must be to blame. And yet, FDA’s decision was nowhere near as senseless as it seemed to Kristof. FDA had solid reasons to consider it safe at the levels found in food — and no, those reasons had nothing to do with industry pressure (at least not so far as I can tell). The earlier studies that found BPA at high concentrations in human blood and urine may have suffered from a serious defect. This part is kind of interesting, so let me try and explain how I think FDA was probably looking at this. As always, please be aware I’m not a doctor and this is my personal blog (and therefore just my personal opinion). With that said, here we go. If you look at the structure of BPA (see below), you’ll find most of it is hydrocarbon; carbon atoms bonded to each other and to hydrogen atoms. Carbon and hydrogen share electrons fairly equally. They can’t form weak interactions with water molecules called hydrogen bonds. True, the two OH groups at the end share electrons much more unequally and can form hydrogen bonds, but they’re a relatively small fraction of the molecule’s surface, and they’re not acidic enough to give away a hydrogen ion and wind up with a negative charge at the pH ~7.4 of your blood. Since most of BPA’s surface is greasy hydrocarbon, BPA dissolves poorly in water. Inside the human body BPA gets absorbed, but less than 1% of the BPA actually makes it into your circulation intact, and your body gets rid of even that 1% very quickly. Based on numerous studies and in-house government research, FDA found that bisphenol A was rapidly metabolized by the liver on its way into the body, so much so that concentrations in blood samples taken from volunteers after consuming food containing BPA were so low they were not detectable. The liver alters most of the incoming BPA by attaching a large sugar molecule called glucuronic acid to one of those two OH groups; some of the BPA gets a sulfate group attached to an OH group instead. Either alteration makes the BPA both harmless and highly water-soluble so the altered BPA is excreted rapidly in your urine. The altered BPA has a half-life in the human body less than 6 hours; the unaltered chemical has a half-life less than two hours. The resulting concentrations in the human bloodstream were far too low to mimic estrogen. BPA is only a weak estrogen mimic; it binds to estrogen receptors thousands of times less tightly than estradiol does, so you’d need much higher concentrations of BPA than what you see to cause a problem. Rats fed hundreds of times more BPA than what humans typically consume didn’t have any problems. But what about the studies that found BPA at high concentrations in blood from people in the general population? It’s difficult to know for certain why their results were higher, but as one toxicologist pointed out in an interview with NPR (and as FDA also noted in their review), it’s likely contamination was to blame. As an analytical chemist who works in the pharma industry, this is an issue I’m only too familiar with. The role of analytical chemistry is to figure out 1) what chemicals are in here, 2) how much of them and 3) what’ll happen to them if they sit around (will they get metabolized, oxidized, break down etc). If you’re trying to measure concentrations of a chemical like BPA in blood samples, you have to be really careful, because BPA is found in some plastic used in the lab; plastic tubes and so forth. To make matters worse, the doctor’s office/lab that collected the blood samples quite possibly collected and/or stored them in plastic syringes or vials that contained BPA. If they did that, well, then the blood samples will almost undoubtedly have picked up some BPA by the time they reached the analytical lab — BPA that wasn’t there to begin with. As noted in the NPR interview, the government toxicologists said they initially ran into contamination problems when they were trying to measure concentrations of BPA in blood. Once they got rid of the contamination problem, they found that BPA generally wasn’t present in blood samples from human volunteers at detectable concentrations. The labs that found BPA at high levels in human blood in earlier studies probably didn’t realize they were looking at contamination — contamination caused either by labware or (even more likely) by plastic used to collect and/or handle the blood at the lab/doctor’s office. So FDA concluded BPA was safe at the levels found in foods for adults and children. But what about babies? Babies don’t metabolize or excrete some chemicals as rapidly as adults; their kidneys and livers don’t filter blood as rapidly. What if BPA had a longer half-life in babies? If it did, its ability to mimic estrogen at high concentrations might be more of a concern. But there wasn’t a good way to study this directly. So FDA and the EU approached this in a different way. There’s data on metabolism of tylenol (aka paracetamol) in babies. You can use that data to figure out how good a baby’s liver probably is at glucuronidating/sulfating something like BPA. You can also look at data from baby monkeys, which are reasonably similar to humans in terms of how they metabolize these kinds of compounds (at least, more so than rats). Based on this, babies also should have negligible exposure to BPA. In pregnant women, mom’s liver takes BPA out of circulation so rapidly fetal exposure to it again should be negligible, and extrapolating based on data from animals human fetuses are also expected to be able to metabolize and eliminate BPA pretty quickly. So what do I think about all this? My two cents would be this. It so happens I like IPAs, and IPAs happen to contain a chemical called 8-prenylnarigenen, which is one of Nature’s more potent phytoestrogens; it’s used in breast enhancement pills, in fact, although I have no idea how well it actually works in that capacity. I’m not worried about 8-PN because I know the amount of 8-PN in an IPA is so small compared to the concentrations required to cause an effect, I would need to guzzle IPAs all day in order to reach those concentrations. And yet 8-PN is almost certainly a more potent estrogen than BPA, and it almost certainly stays in the body far longer than BPA does. BPA has a half life less than 2 hours and only 1% makes it into circulation, whereas 8-PN (at least based on this study) has a half-life > 24 hours, partly because some of it gets excreted in bile and then part of what got excreted in the bile gets reabsorbed, a cycle that extends the amount of time it spends in the body. In other words: I think if you are an adult human, BPA is not a terribly pressing concern. I can understand why people might be worried about babies and BPA, because unlike with adults you can’t study baby metabolism of BPA directly so you have to use indirect data like metabolism of tylenol or metabolism in baby monkeys. That’s something to think about. But in people of other ages, the data clearly demonstrates BPA is rapidly metabolized and excreted — so rapidly, in fact, concentrations are typically not detectable, so nowhere near — not even close — to the concentrations you would need to have an estrogen-mimicking effect. You kind of get to the point where you have to ask: how much time and energy needs to be devoted to this chemical, when the existing data makes it look like it’s reasonably safe, at least at current levels? And at what point does this become a distraction from other environmental problems? Because, no matter what Fox News may say, we do have some pressing environmental problems. We are going to run low on fossil fuels sooner or later, we don’t yet have an economically viable replacement, and in the meantime we’re conducting a giant global experiment to determine how much temperatures will rise if we return a billion years’ worth of buried CO2 to the atmosphere. The experiment’s far from over, and so far the results don’t look good. We make lots of plastic bottles and bags, and sure they break down very slowly if you expose them to UV light and oxygen, but then we bury them in landfills where they’re exposed to neither of the above, and we have no idea how long they’re going to remain intact down there. Either that, or we litter them, and then they make their way into the ocean and break down slowly, usually starting by breaking into small pieces that may get eaten by fish. There are all kinds of species on the brink of extinction thanks to habitat destruction. In some parts of the world, we’re running low on water; in others, we have too much. And yes, there are some chemicals we’re manufacturing we’d probably be better off without; think about carbofuran or aldicarb, for example. So no, I’m not particularly worried about BPA. Yes, that’s just my opinion, but the available data suggests to me at least (and apparently also to FDA) BPA’s unlikely to be a serious safety concern for adults, at least at the levels currently present in your food. Unfortunately, once you’ve started a controversy like this it’s difficult to rewind; people take up positions and stake their reputations on them, and raising fears is a lot easier than assuaging them. I have no doubt the BPA controversy will continue for years to come. Charcoal grilling might be adding carcinogens to your meat. Why doesn’t that bother you? In the early 1770s London doctor Percival Pott noticed something strange about the chimneysweeps in his town: an unusually high percentage of them had a rare form of cancer. Most chimneysweeps at that time were boys under the age of fifteen because kids were better at squeezing into narrow chimneys. Orphans and street kids, most of them, with not much family to care what happened to them either way. Pott found that by the time they hit their twenties and thirties they were unusually likely to get cancer of the scrotum. Outside of chimneysweeps scrotal cancer was pretty rare. But among chimneysweeps — much more common. He remembered one patient in particular, a young man aged 28 with a tumor the size of your hand growing out of his balls. What was spreading this bizarre epidemic of cancer among London chimneysweeps? In a brilliant flash of intuition, Pott correctly identified the cause. He realized there must be something carcinogenic in fireplace soot and smoke. Young boys climbing up chimneys wound up covered in soot, of course, and being about as clean as kids typically are, they’d never bother to clean it off. Maybe their faces and hair, but the rest, probably not. The soot left sticking to their skin contained something dangerous — something that caused cancer. At that time chemistry was still in its infancy, and even though he’d figured out soot was carcinogenic, Pott didn’t know which chemical in the soot was the problem. It wasn’t until the 20th century that modern analytical chemists nailed the culprit: a potent natural carcinogen called benzo[a]pyrene found in smoke and ash from burning logs and cigarettes. I’m not telling you this to scare you away from the grill necessarily. Is benzo[a]pyrene a carcinogen in lab tests? You bet, and a potent one too. But does that mean the dose in your smoked turkey sandwich is enough to increase your cancer risk? I don’t know — the jury’s still out. Among doctors this is still a matter for debate. How can there be a debate about this? It’s a carcinogen, we’ve known that ever since Dr. Pott first noticed this weird anomaly among London’s chimneysweeps. So don’t put it in my sandwich. What’s there to argue about? And yet, not so simple. You see, the cells in your body that serve as the first line of defense — the cells in the lining of your intestine — if anybody’s getting DNA damage from benzo[a]pyrene, they’re first in the line of fire. They get turned over pretty rapidly, on the order of 4-5 days, and replaced with fresh cells by cell division. That’s why it’s at least possible to have a situation where benzo[a]pyrene caused DNA damage but the dose you got from your bacon sandwich was too small to actually increase your risk of cancer; the cells that got damaged got replaced shortly thereafter. Moreover, how much or how little benzo[a]pyrene is added to the meat depends on how it’s smoked or grilled exactly. So the question is, as always: how much is a dangerous dose? That’s what we don’t know. That’s why the jury is still out. Researchers have tried to look for statistical correlations but it’s tricky; you can’t usually get the kind of information you’d need from a survey, and most of us probably can’t remember everything we ate last month or last year and exactly how it was cooked. You could always say why take a risk? Why eat food that contains a known carcinogen? I’ll pass on that hot dog, thanks much. But then you’d have to skip grilling hamburgers and cooking bacon and Fourth of July hot dogs and that’s something most folks won’t do. Just imagine if the FDA came out next month and told everyone, hey, kids, ummm….we’ve decided you can’t eat bacon anymore because…well, it contains something that might be bad for you, and we’re the FDA and we’re here to take care of you, so no more bacon for you. I can’t think of many issues that would unite most Republicans and Democrats, but I’m guessing that right there is one of them. Besides, it’s easy to forget about benzo[a]pyrene and other natural carcinogens like heterocyclic amines because you don’t see them on ingredient lists; they weren’t added by the manufacturer, they were put there by none other than “Mother Nature” herself (with the aid of the chef). The irony here is rich. Folks get all riled up about GMOs and food coloring and potassium sorbate and so forth; and all the while, they’re adding a natural carcinogen to their food that’s probably more dangerous than any of the things they’re protesting could ever be. Trouble is “Mother Nature” doesn’t actually desire our happiness (as I never tire of pointing out). Nor are our bodies or our natural environment as well-crafted as we like to believe. And benzo[a]pyrene is a nice illustration of that fact, because it’s not actually carcinogenic in and of itself. Like many carcinogens, benzo[a]pyrene isn’t a carcinogen until enzymes in your liver have turned it into one. But why would your liver do that? The simple answer is because your body wasn’t designed; it was cobbled together by a few billion years of messy, brutal evolution. There’s a reason why your liver works the way it does, and it has to do with plants: the ones that are trying to kill you. It’s kind of interesting to think about how many plants you can’t eat. There’s a gazillion different species of plants in our world, and the ones we can are a tiny fraction of a fraction of the plant species we know. The others are poisonous or distasteful or too tough (ever try chewing on wood?) or too fibrous or too difficult for our digestive system to break down. Even out of the handful we do eat, many are plants we’ve cooked or bred over time to make them less poisonous. Take almonds, for example. Like peach and cherry pits, wild almonds contain a compound that breaks down to release cyanide in your digestive tract. Stone Age farmers somehow found a mutant tree that didn’t have the cyanide and bred it to make the almonds we eat today. Or take soybeans; we eat them, but we never eat them raw, because raw soybeans make you sick. They contain a protein that interferes with your digestive system. Cooking them denatures that protein so you can eat the bean with no ill effects. Same goes for raw kidney beans. The ancestors of the modern potato and tomato were rich in a deadly poison called solanine, and even the potatoes we eat today are poisonous if they turn green; when they are exposed to light over an extended period of time, the tubers ramp up production of both chlorophyll (to utilize the light they’re getting) and solanine (to stop anyone from eating them). And did you know that nutmeg and cinnamon naturally contain traces of a chemical called safrole which is classified as a weak carcinogen by the FDA? No lie. You can’t add safrole to anything you make because FDA found evidence to show carcinogenicity at high doses, so they banned it. But you can add nutmeg and cinnamon which contain safrole, because — well, I don’t know why, really. I could go on, but I think I’ve made my point. There’s a lot of plants out there that try to poison animals who eat them. Even some of the plants we eat today are descended from poisonous wild relatives and were only made safe by breeding. So back in our hunter-gatherer days, plants that contained either weak or potent poisons were a constant hazard. That’s why humans (and most other animals) have been equipped by evolution with ways to get rid of possible poisons (natural or otherwise) that find their way into our system. The three key tools your body uses are the kidneys, the bile, and the metabolic machinery of your liver. Your kidneys filter your blood continually, hanging onto useful chemicals like sugars and amino acids and letting everything else go into the waste stream. This works really well for chemicals that are highly water-soluble, and your body can usually get rid of them pretty quickly that way. Your body also excretes chemicals for which it has no use through your bile. Sometimes your liver chemically alters them as well. Now the liver is just a biochemical machine. It doesn’t sit there and think about this and go, “gee, this chemical might be a poison because it’s highly reactive, but it WOULD be a lot less reactive if we stuck an oxygen on it right here, so….” Nothing like that. It has a bunch of enzymes that latch onto molecules with certain kinds of structural features and shapes and then alters those in a specific way. Sometimes this makes a chemical less toxic; other times it actually makes the chemical much worse and more dangerous. Methanol isn’t very dangerous, for example, until your liver turns it into formaldehyde. The ethylene glycol in your antifreeze isn’t very dangerous until your liver turns it into oxalic acid. Benzene isn’t a carcinogen until your liver turns it into one. Same goes for benzo[a]pyrene, the carcinogen you’re adding to your hamburgers when you charcoal-grill them. How do we know what the liver does to stuff? Turns out it’s simpler than you’d think. If you take homogenized liver (basically liver that’s been ground up, like if you put it in a blender) from a human donor, you can put it or a fraction (S9, microsomes) from it in a test tube at 37C with some buffer to maintain the pH and a couple other additives, then add the drug or chemical you want to test. Next you go back and do some chemical analysis to see whether the liver enzymes in the homogenate altered the chemical and if so what they converted it into and at what rate. This kind of experiment is very common in the pharma industry, because drugmakers need to know what the liver may do to their drug. It’s also how toxicologists know the liver and the lining of your intestines take benzo[a]pyrene from wood smoke and bacon and hot dogs and convert it into a carcinogen that can react with DNA. It might seem odd the liver would do something so bizarrely stupid, but remember the biochemical machinery of the liver wasn’t designed, it was cobbled together by evolution to deal with poisonous plants. Our mammalian ancestors got bombarded by chemicals from plants as part of their diet. Sure, the kidneys will filter these chemicals from the bloodstream, but if the chemical in question is a deadly poison, that may not be fast enough. They needed biochemical machinery that could take non-useful chemicals and chemically alter them quick, just in case they were poisons — if they are you need to alter them before they can do their job. And if that biochemical machinery occasionally happened to take the odd chemical and make it into a carcinogen…well, that was less important on the whole than rapidly altering possible poisons, because some of the plants you eat are trying to kill you. If you aren’t equipped to deal with that, some of them will succeed. Evolution doesn’t usually come up with perfect solutions; just solutions that work. It’s not an artist; it’s a tinkerer. Which is why benzo[a]pyrene is a problem. The odd thing about this whole story to me is this. Benzo[a]pyrene is a fairly potent carcinogen; toxicologists have shown it causes cancer in animals, and there’s plenty of evidence going all the way back to Dr. Pott to show it can cause cancer in humans. And yet here we are adding it to our meat by smoking it or grilling it over charcoal and so forth. OK, yeah, so as I said before, the jury’s still out on exactly how dangerous the doses in cooked meat may be, but…stop and think about this a minute. Just imagine that a major corporation was adding a known carcinogen to their food products. How upset would we be? Just imagine the kinds of blog posts and editorials you’d see from The Food Babe and the NYT. A lot of people would be outraged, and rightly so. But here we keep putting benzo[a]pyrene in things, and…no outrage. No outcry. Silence. All kinds of people are angry about food coloring, apparently, because Kraft recently responded to a petition by pulling food coloring from their mac and cheese. But food coloring has been studied extensively and there is no reason to think it is carcinogenic. The benzo[a]pyrene in your smoked meat, on the other hand, is almost certainly far more dangerous. But it’s natural, so no one is angry about it. That’s why I often feel so confused about the way our society feels about chemical additives (or perhaps food in general). I feel like sometimes we worry a great deal about things that probably aren’t very important for our health or environment or the future of our species, and don’t worry very much about things that could easily be just as dangerous if not more so. We care about our health and the environment, and so we eat free-range organic smoked turkey packaged in plastic wrap. The turkey has been smoked and therefore has benzo[a]pyrene added; the plastic wrap was made from non-renewable crude oil derivatives and will wind up in a landfill as soon as we’re done with it. But it’s all natural, the turkey is free range and organic and no major corporations were involved, so we are One With Nature and everything is all good.